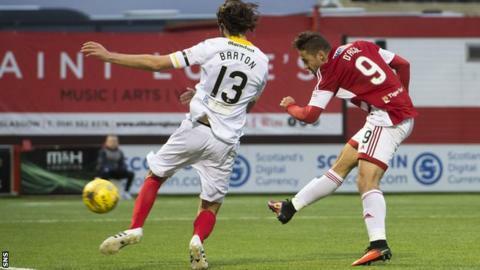 Hamilton Academical drew in the Premiership for the ninth time this season after Partick Thistle fought back for a point at New Douglas Park. Alex D'Acol pounced on a Liam Lindsay error to fire the hosts ahead. Ade Azeez missed with a lob and Kris Doolan hit a post as Thistle pressed in the second period. Sean Welsh did find the net with a shot in the second period to level and team-mate Callum Booth later had a goal disallowed for offside. These two sides, like many in the bottom seven in the Premiership, are incredibly well-matched, making it very difficult to determine who might be involved in a relegation scrap and who will be vying for a top-six place. Five of the pair's last six meetings have ended in stalemate and few would have been startled by this one going the same way. Even their formations were almost mirror images, with both managers playing three at the back, five in midfield and two up front, which in the first half meant both sides rather cancelled each other out. But the second half was a more open encounter as Thistle tried to force the issue and though they got the equaliser their pressure deserved, they could not find a winner. The Jags, who scored when struck from inside the box, did stem a three-match losing run and move off the bottom of the Premiership on goal difference. But their tendency not to take advantage of the good openings they create is proving costly on an almost weekly basis. Azeez missed a glorious opportunity in the first period and Doolan was unfortunate to see his header come back off the post. They pounded Accies' goal after the break, Ryan Edwards having a good effort fielded by Gary Woods before Welsh coolly side-footed past the keeper. Thistle were denied a victory by the assistant's flag - Chris Erskine adjudged to have been offside when he crossed for Booth to tap in. Accies have not beaten Thistle in 11 attempts now and would have been relieved to survive that scare. The point keeps them above their opponents but they now face a tough run of games before Christmas, with visits to Inverness and Aberdeen, meetings home and away with Celtic and a home match against Rangers. They have now drawn seven of their last nine games and, like Thistle, need to convert single points into three on a more regular basis in order to avoid a battle against the drop. Apart from D'Acol's early goal - when he robbed Lindsay before rounding Tomas Cerny to slotting into the net - they created relatively little but held firm in the second half to secure the point. Hamilton Academical player-manager Martin Canning: "On the balance of play I think a point was probably a fair result. I didn't think either team did enough to win it. "But for us it's yet another time we've put ourselves in a winning position and not taken three points. "But you can't think every time you go ahead in a game you should win it. I think you've got to earn the right to win it and I didn't think we did. "At the minute it seems teams are capable of winning one week, getting beaten the next week and drawing the next but not putting together a sustained run if you look at the pack of seven teams." Partick Thistle manager Alan Archibald: "We thought at the time Chris Erskine was onside and we watched the footage back and he is. It's a very poor decision from the linesman. "Very disappointing. That's what they're paid to do and we've come away with one point instead of three because of it. "These decisions are very costly. We put a lot into that second half and we thought we did enough to get all three points but we'll use it to drive us on. "There's not a lot in it. It's a very tight table but we stressed to the lads we need to win these six-pointers with teams roundabout us." Ziggy Gordon (Partick Thistle) wins a free kick in the attacking half. Greg Docherty (Hamilton Academical) wins a free kick in the defensive half. Attempt saved. Greg Docherty (Hamilton Academical) right footed shot from outside the box is saved in the centre of the goal. Danny Seaborne (Hamilton Academical) is shown the yellow card for a bad foul. Foul by Danny Seaborne (Hamilton Academical). Corner, Hamilton Academical. Conceded by Ziggy Gordon. Corner, Partick Thistle. Conceded by Danny Seaborne. Foul by Eamonn Brophy (Hamilton Academical). Attempt missed. Sean Welsh (Partick Thistle) right footed shot from outside the box misses to the right. Attempt missed. Alejandro D'Acol (Hamilton Academical) right footed shot from the centre of the box misses to the right. Attempt blocked. Abdul Osman (Partick Thistle) right footed shot from outside the box is blocked. Attempt blocked. Alejandro D'Acol (Hamilton Academical) right footed shot from the centre of the box is blocked. Attempt missed. Kris Doolan (Partick Thistle) left footed shot from the left side of the box misses to the right. Attempt saved. Alejandro D'Acol (Hamilton Academical) header from the centre of the box is saved in the top centre of the goal. Goal! Hamilton Academical 1, Partick Thistle 1. Sean Welsh (Partick Thistle) right footed shot from the centre of the box to the bottom right corner. Substitution, Partick Thistle. Chris Erskine replaces Adebayo Azeez. Attempt saved. Ryan Edwards (Partick Thistle) right footed shot from the left side of the box is saved in the centre of the goal.